Europe is confronted by an obesity challenge. Rates of obesity have climbed fast over the past decades and estimates suggest that obesity rates will continue to grow over the next decades. Obesity is a complex disease and a source for many other medical problems like diabetes type 2 and cardiovascular diseases. Therefore, the growing prevalence of obesity also affects healthcare expenditures and labour supply in the economy. On current trend, obesity will in future have a significant impact on healthcare spending and the productivity of Europe’s economies. There is a strong case to be made for policy leaders to give greater attention to obesity. The growth of obesity needs to be addressed and European countries need better prevention policies for that to happen. Furthermore, there also has to better policies to treat people that already suffer from obesity and associated diseases. As the medical science has rapidly advanced its understanding of obesity, and now agreed on clinical guidelines for surgeries of obese patients with type-2 diabetes, it is time for political leaders to respond to the opportunities created by new innovation. The EU does not take a leading role in devising healthcare policies in Europe. Still, it has increased its ambitions in helping governments to reduce the growth of obesity. However, the EU can do more – and there is a natural role for it in helping governments to learn from best practices and to evaluate how well, or bad, they are responding to the obesity challenge. Europe is facing an obesity crisis of epidemic proportions, one that threatens to overwhelm the EU’s already struggling economies and place a tremendous burden on its healthcare systems. Data from the World Health Organisation (WHO) indicate that the proportion of those who are overweight or obese will rise substantially in the EU over the next decade if the issue is not tackled. It is time for both governments and European Union institutions to take comprehensive action. Obesity is a big fiscal challenge for governments because the growth of obesity in Europe has reached such proportions that it inevitably will drive up healthcare costs in the future. Furthermore, when a high proportion of working-age population is obese, there are also economy-wide consequences because of the productivity losses. Obese people are more often away from work than others because they require more medical care, and they are ending their working life at an earlier age than others. What adds more significance to the challenge is that past and current policies to reduce the incidence of obesity have not been very effective – and that few governments have new ideas for how to tackle it. It is remarkable that governments take a lax attitude. McKinsey Global Institute estimates the effects on GDP from obesity to be similar as the effect of smoking. It is well established that obesity causes several non-communicable diseases such as type 2 diabetes and cardiovascular problems. Population ageing will exacerbate the issue as elderly people with obesity demand far more healthcare than those without the condition. The exact healthcare costs of obesity today can only be estimated, but governments know that costs are growing. The OECD estimates that average healthcare expenditure for an obese person is 25% higher than for someone of normal weight. In the UK, the government’s Foresight study from 2007 estimated that obesity will represent 13% of total healthcare costs by 2050. Obesity is already estimated to cost Europe 70 billion euro annually in healthcare costs and lost productivity. Few governments in Europe have a comprehensive strategy to reduce the obesity burden and the rapidly rising associated healthcare costs. As highlighted in recent studies by The Economist Intelligence Unit’s, policy-makers have focused on preventing healthy people from becoming obese. And indeed, lifestyle-focused programmes have an important role to play in preventing obesity in people with a healthy weight. However, a policy focusing only on prevention will neglect those who are already severely obese and the costs associated with already existing obesity. A change in the default setting is crucial as the big expected increases in future healthcare expenditures will predominantly come from such patients—people that have already developed obesity or are serious overweight. More co-ordinated intervention is needed for those struggling with the problem. This means comprehensive treatment that addresses the complexity of obesity and creates a more targeted and supportive environment for those who are already obese and unlikely to benefit from behavioural change alone. A combination of interventions, along with broader changes in societal attitudes to how we eat and exercise, are likely to have the best effect. This Policy Brief will take a closer look at the growth of obesity in Europe and discuss what policy actions can be taken at the EU level. It starts with a chapter that analyses data on obesity and considers estimates on future rates of obesity. Then follows a chapter that examines existing policies at the EU level and that outlines some fresh workstreams for what more can be done. The Policy Brief ends with a conclusion. Government Office for Science, 2007. EIU (2015) and country studies. Since the 1980s there has been a sharp increase in the prevalence of overweight and obesity around the world. In Europe, it is estimated that over 50% of all men and women were overweight in 2014, and on average around 24.5% of all women and 21.5% of men were obese, according to the World Health Organisation (WHO). 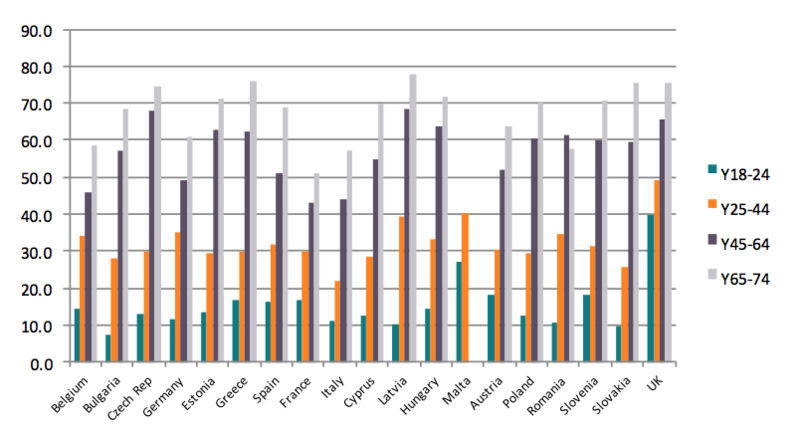 Charts 1 and 2 show the prevalence of overweight and obesity in different European countries. The charts are based on the latest data from Eurostat: it’s latest survey was done in 2008 and a revision of the data is planned to be released in March 2017. However, the recent Health Interview Survey from late 2016 gives update figures for 2014 that indicate an increase in the rates of obesity. The WHO also offers later data on rates for overweight and obesity, but WHO estimates are less precise than Eurostat data. 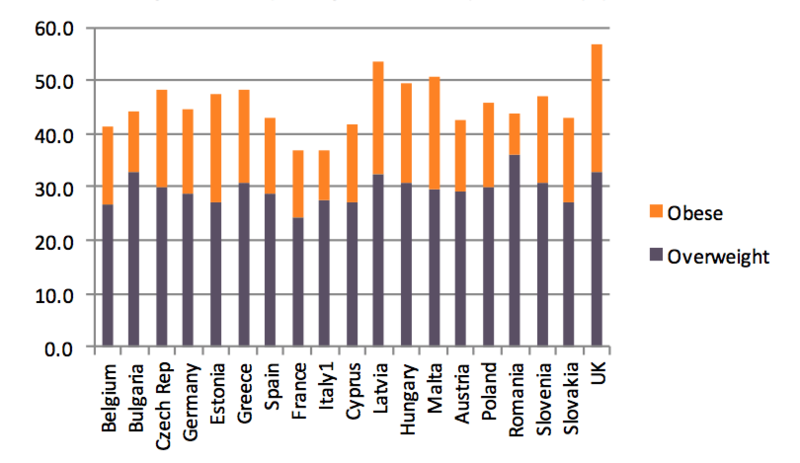 The share of the population that is overweight is quite similar across Europe. The rates of overweight vary, but the variations are not as big as the differences in obesity when European countries are compared. 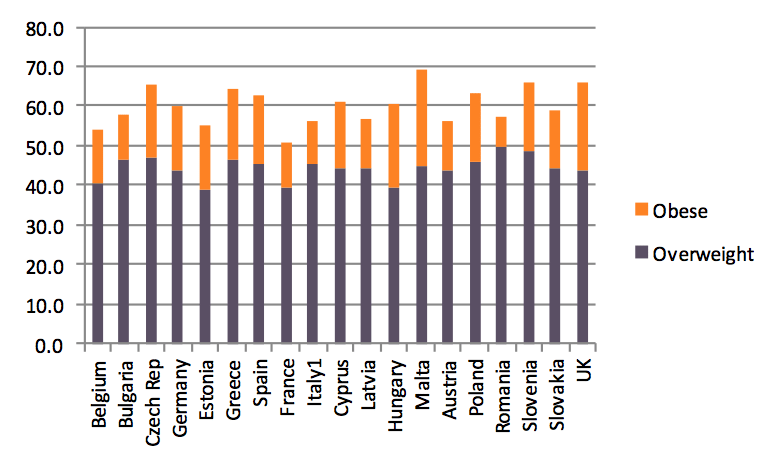 For example, while Romania has the highest share of overweight people, it also has the lowest share of obesity. Countries in the southern rim of Europe appear to be more represented among countries with the highest share of overweight than countries from the northern parts of Europe. In the European Union, between 36.9% and 56.7% of all women were overweight or obese according to data from 2008-09 (which, at the time of researching this paper, was the latest year for which data is available). The figures for the male population vary between 51% and 69.3% in the countries for which data is available. Amongst women, the prevalence of overweight and obesity tends to be higher in the northern part of Europe, whereas countries in the southern part of Europe have higher rates of overweight and obesity among men. Overweight and obesity often results from a variety of factors: physical inactivity and unhealthy diets, as well as alcohol use, are some of the known sources. But obesity is more complex than just to originate from patterns of unhealthy living. There is a genetic component to the disease and medical research has in recent years made significant breakthroughs in understanding the nature of the disease. Physical activity, nutrition and alcohol are generally the main risk factors that cause non-communicable diseases, notably cancer, diabetes, or cardiovascular and lung diseases. It is estimated that non-communicable diseases are the main cause behind almost 86% of deaths in Europe, and 77% of the disease burden. Cardiovascular diseases, including hypertension (high blood pressure), cause more than half of all deaths in Europe. At the same time, diseases such as cancer, diabetes, cardiovascular and respiratory diseases represent the bulk of diseases that can be partly prevented in Europe. Fighting obesity plays a central role in reducing the number of people with such diagnoses. Between 1990 and 2010, the so-called global burden of disease has continued to shift away from communicable to non-communicable diseases. The Global Burden of Disease Study 2010 concluded that dietary risk factors and sedentary lifestyles accounted for 10% of disability adjusted life years globally in 2010. Moreover, obesity and overweight are estimated to be the principal causes of 44% of all cases of diabetes around the world, 23% of ischaemic heart diseases and between 7-41% of all cancer cases, according to WHO figures. As for the European Union, 80% of all type 2 diabetes cases among adults are related to obesity, 35% of ischaemic heart diseases and 55% of hypertensive diseases. All in all, the WHO considers obesity to be the 5th leading death risk. The proportion of obesity and overweight among adults tends to increase with age in all European countries. This pattern is particularly clear among women. As for men, there is a general increase in the prevalence of obesity up until the age of 65. Thereafter the prevalence of obesity is somewhat diminishing. In recent decades, there has been a significant increase in the number of people who are obese in OECD countries. Before the 1980s, around 10% of the population was considered obese. In just 30 years, the rates of obesity in OECD countries have more than doubled, and it is predicted that the situation will deteriorate further. In half of the OECD countries, at least one in two people is today overweight or obese. While it is estimated that the rate of overweight people (BMI 25-30) within the age group of 15-74 will stabilise in most countries, the rate of obesity (BMI >30) is however likely to continue to increase. The OECD has provided estimates on growth of obesity in selected EU countries, and they are presented in Table 1 below. Obesity among children is also a growing trend. If it remains unaddressed, it will most certainly have an impact on health and healthcare costs in the future. People who become obese at a young age usually develop diseases that require medical attention later in life. Among children up to 4 years old, the prevalence of overweight and obesity has increased globally over the last decade. In 1990, 4.2% of all preschool children were overweight or obese. In 2010, the figure had increased to 6.7%, and it is expected to increase to 9.1% in 2020. Looking at children between 5-17 years old, around 21.4% of all girls and 22.9% of all boys were overweight or obese in OECD countries in 2011. Excess weight can entail health and medical complications even at a young age, including diabetes, hypertension, and cardiovascular problems. Children who are overweight or obese are more likely than non-obese children to be obese later in life. Even if the excess weight is lost, childhood obesity is one of the main causes behind health and medical complications later in life, according to a recent study. Also, childhood obesity incurs healthcare costs at an early age. A recent German study showed, for instance, that overweight and obese children have higher healthcare costs than other children at the same age: costs are €62 higher for obese children per year, and €27 higher for overweight children, in comparison to a child with a healthy weight. In relation to this, a study from Ireland showed that the percentage of hospital days related to childhood obesity increased from 0.81% to 1.37% of total hospital days in 2004, involving an increased in expenditures from €0.9 to €2.7 million. The economic burden of obesity is increasingly documented. The costs come from different sources. There are direct healthcare costs – costs that are represented by healthcare expenditures. With a growing share of the population that are obese, these costs are increasing – and will continue to increase in the future. Several studies point out that it is difficult to measure direct healthcare costs as obesity is a cause to several diseases like diabetes type 2, and that the total direct healthcare costs are likely higher than estimates show. The indirect costs of obesity are higher because they include the loss to productivity because of obesity; people that are obese have higher rates of work absence and lower rates of labour participation. Estimates for the UK, for instance, suggests that the direct healthcare costs of obesity stood at approximately 4.2 billion pound in the noughties, and that the indirect costs of obesity were 27 billion pound in 2015. With growing rates of obesity, the burden of the disease is about to become a central issue for fiscal and economic policy in Europe. The fiscal effects will mainly arise because higher rates of obesity will push up healthcare expenditures. There is another dimension to it as well; people with diseases like obesity also need financial support from social security systems at a greater degree than the population average. The growing economic burden will be a consequence of changes in the labour market and how the economy broadly will reallocate resources because of how labour participation changes. And this type of burden will most likely grow rapidly over the next couple of decades unless obesity rates cannot be better managed. The data is from the WHO Global Health Observatory data repository. Tyrrell et. al., 2016; Choquet and Meyre, 2011. For overview studies of the economic burden of obesity, see Müller-Riemenschneider et. al., 2008; Specchia et. al. 2014; Dee et. al., 2014. European policies to tackle obesity are inadequate – both at the EU and member state level. It is also clear that existing policies to reduce the growth of obesity, or even the proportion of people that are obese, have not been effective. As we have seen in the previous chapter, obesity has expanded over the last decades, despite attempts by governments to control obesity rates and their growth. Unfortunately, given the growth in the share of overweight people in Europe in the past, expectations are that the share of people that are obese in the next decades will increase even more. Policies at both the EU and member state level have almost entirely been focused at food and nutrition. The guiding view has been that policies should aim at prevention of more people becoming obese, and there has been a very strong – almost ideological – tenor in that view suggesting that policies should exclusively be using prevention strategies. Prevention policies are a critical component of a comprehensive policy to fight the growth of obesity; it is prevention policies that can address the growth of both overweight and obesity. Obviously, the policy instruments chosen have not been effective, and governments will have to consider why these instruments have not been effective. Policies at the EU level has been cautious because many of the issues around obesity are controversial and the EU lacks a clear treaty-based mandate to address issues around health and healthcare. The two main policy components have been a strategy on nutrition, overweight and obesity-related health issues – comprising several strands of policy – and, more recently, an Action Plan on childhood obesity. These policies build largely on stimulating more product information and physical activity, better nutrition and dietary standards, and attempts at affecting urban transport solutions with the view of stimulating people to walk or use bicycles rather than cars. What more can be done at the EU level to address Europe’s growing obesity challenge? There is much that can be done in order to complement existing policies and ambitions. 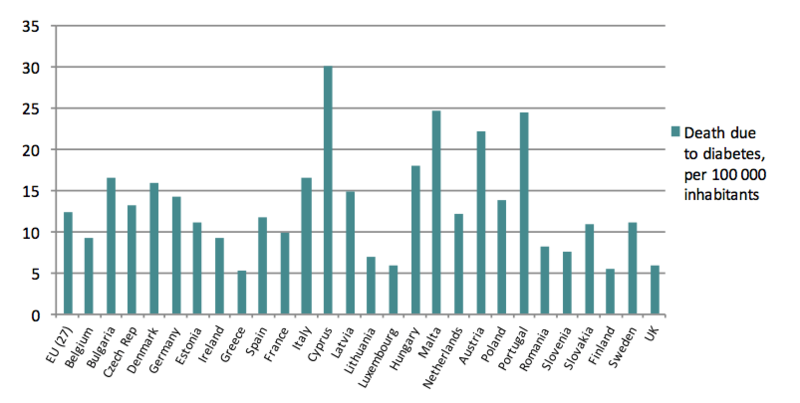 One obvious area is research and supporting research through the EU budget. The science of obesity is complex, but has made significant advances in recent times and offer new opportunities for developing both prevention and treatment policies that are much more effective than past policies. Moreover, while the EU is developing policies on nutrition, the fact remains that the EU also supports the production of food or agricultural produce that have consequences for dietary standards and the intake of sugar and carbon hydrates. In this chapter, we will outline three workstreams that are more focused on direct obesity policy. They all start from the assumption that the EU does not make decisions on many issues regarding health and healthcare, but that there is a critical role to play for EU institutions to generate a better understanding about policy and policy effectiveness, and generally serving as a hub for sharing knowledge and setting benchmarks. The natural starting point for forward-looking policy work related to obesity is to analyse how past policies, predominantly focused at prevention, have performed. Governments and healthcare systems in Europe have – with a varying degree of ambition – devised policies on obesity for many decades. However, very little is known about these policies and their efficacy. There have been some attempts to review some aspects of obesity policy. International organisations like the OECD have helped to put light on some components of obesity policy by cross-country comparisons. Yet the most revealing aspect of many analyses is their incompleteness. Still, when recommendations are made by governments and others about future policy, they quite often follow the path of existing policies. “More of the same” seems to be the leitmotif. That may be a motivated policy conclusion: policies may have worked well, but not been capable of affecting the growth of obesity because of a lack of resources and political attention. There are, however, good reasons to think that there is a strong case to be made for improving the policy design. First, as the previous chapter discussed, there has been a strong and constant growth in the share of the population that is obese or overweight. It is difficult to marry observations of obesity rates and their growth with the conclusion that the choice of policy has been correct. Second, international studies show that there are variations between countries in the choice of policy. There are also variations in the cost and performance of policies. Obviously, some countries have been more successful than others in reducing the growth of obesity. While there are many factors that determine these developments, it is likely that policy has been one of them. Improving the design of obesity policy, and the mix of different instruments, is important for reducing the growth of obese people and managing the healthcare costs associated with obesity. For that to happen, we need to know what has worked well and what has not. It makes sense to conduct such reviews also at the international or the European level. It allows for an integrated approach where countries can learn better from each other. Analysis done by others than responsible governments is often dispassionate and less constrained by domestic political sensitivities and prejudices. Obesity policy also has to change in order to involve policy areas and instruments that traditionally have not formed part of what governments have done to address obesity and its consequences. These changes are a natural reflection of the fact that circumstances have changed, and the most obvious of these changes is that the number of obese people has grown. Forty years ago, it made sense to focus obesity policy on prevention, but today there has to be a balance between prevention and treatment policies. Prevention policies are not necessarily adequate policies for people that already have develop obesity and suffer from a disease. For people that both suffers from obesity and type-2 diabetes there has been a growing medical consensus about the need for surgical treatment, and a growing number of countries today also offer the reimbursement of obesity treatments. Treatments also vary and healthcare systems across Europe are gradually evolving towards an increased use of surgical treatments, pharmaceuticals and professional lifestyle management programmes. The combined use of all these treatment approaches are likely to grow. Changing circumstances and medical innovation prompt a new issue for governments: what is necessary for different policies and approaches to become integrated and reinforce each other? For Europe’s obesity challenge to be better managed, there is an obvious need to break down the barriers between prevention and treatment approaches, and between different treatment approaches. A cross-country system-performance analysis could help to put light on how various parts of governments and healthcare systems work with regard to obesity – and the extent to which they work together and take an integrated approach. There is much to be learned from such an evaluation. Currently, policies in many European member states evolve spontaneously and tentatively and there is far too little coordination between various agents with different responsibilities. Policies on treatment remains absent in work at the EU level to address obesity. At the same time, this is the area where there is most development, both in treatment methodologies and in healthcare systems. Medical innovation has created new opportunities and a growing number of governments have started to develop policies about access to treatment. Behind that development stands also the scientific understanding that obesity is a disease that requires treatment. There are now clinical guidelines for surgeons and endocrinologists that are working with obese patients. At the Diabetes Surgery Summit Consensus Conference earlier in 2010, medical scholars set out recommendations for bariatric surgery to treat diabetes type 2, and work since then led to the guidelines established earlier in 2016. Governments have also realised that treatment of obesity have a medical rational because of its source in metabolic conditions. Furthermore, governments have also acknowledged that treatment of obesity can be an economically rational strategy because obese patients generally require more medical care than other patients. While there is a cost to governments that reimburse obesity treatment, they can also make savings in expenditures in areas like type-2 diabetes and cardiovascular healthcare. The economics of obesity is a strong reason for the EU to activate its role in obesity treatment. For many countries in Europe, the growth of obesity and associated diseases have consequences for the fiscal sustainability of their healthcare systems. A recent EU analysis of healthcare sustainability showed that there is a general concern about the development of healthcare expenditures as populations grow older. It also identified obesity and other non-communicable diseases as new cost-drivers in healthcare systems. The question it left unaddressed, however, is the fiscal consequences of various approaches to addressing obesity. That should now be the next task that the EU sets itself. There is already a great degree of collaboration and coordination between member states in the area of health technology assessments. Such evaluations are important in helping governments to understand both the medical and the economic consequences of a treatment. When governments collaborate they can also help to provide greater transparency about the conclusions they reach and therefore help other governments to make decisions about new treatments and technologies. There is an important role for the EU to play in helping governments to learn from each other in how they have approached the new medical and clinical opportunities for obesity treatment. It is not the task of the EU to make decisions about what governments should do, but the service that it can offer to member states is to creating a better platform for governments to access knowledge and best practices. As no other regional or international entity is doing it for the evolving area of obesity treatment, there is a greater demand for improved access to knowledge than in many other fields of healthcare policy. Europe is confronted by an obesity challenge. Rates of obesity have grown fast in Europe over the past decades – and the share of the population that is obese is expected to continue growing over the next couple of decades. While these observations are generally known, there is far less knowledge about what governments can and should do to address obesity, help patients, and manage the cost burden of obesity. Governments have for a long time devised policy with the aim of controlling obesity growth, but little is known about the efficiency of these policies. Now governments are also presented with a new challenge – to address not just the growth of obesity but the medical and economic consequences of patients that are already obese. The obesity challenge unites all member states in the EU. While healthcare policy is not an area of policy with significant powers for the EU institutions, there is generally a growing need for governments to improve efforts of collaboration. Obesity policy is a case in point. EU governments make investment in both prevention and treatment of obesity, but know little about the effectiveness of policies and do not routinely share information about what has worked well, and what has not. The EU can help to fill that void, and there is a particular urgency to it as governments are responding to changing circumstances. One significant development underway is the improved scientific understanding of obesity, the new clinical guidelines, and new medical technologies to treat obesity and reduce the costs associated with obesity. These developments present new opportunities for governments to address medical and economic consequences of obesity, and to improve obesity policy generally by having more of an integrated approach. The EU could help governments to better exploit these opportunities. Choquet, Hélène and Meyre, David, 2011, “Genetics of Obesity: What have we Learned?” in Curr Genommics, 2011 May; 12(3): 169–179. Dee, Anne, Karen Kearns, Ciaran O’Neill, Linda Sharp, Anthony Staines, Victoria O’Dwyer, Sarah Fitzgerald and Ivan J Perry, 2014, “The direct and indirect costs of both overweight and obesity: a systematic review” in BMC Research Notes 2014 (7):242. Eatwell Project, 2012, Effectiveness of policy interventions to promote healthy eating and recommendations for future action: evidence from the EATWELL project. EIU, 2015, Confronting Obesity in Europe: Taking Action to Change the Default Setting. Economist Intelligence Unit. Eurostat, 2016, Health Interview Survey 2013/2016. Government Office for Science, 2007, Foresight, Tackling Obesities: Future Choices – Modelling Future Trends in Obesity & Their Impact on Health, 2nd edition. McKinsey Global Institute, 2014, Overcoming Obesity: An Initial Economic Analysis. McKinsey Global Institute Discussion Paper. Müller-Riemenschneider F, Reinhold T, Berghöfer A, Willich SN, 2008, “Health-economic burden of obesity in Europe” in Eur J Epidemiol 2008; 23(8), pp. 499-509. Neovius K, Johansson K, Kark M, Neovius M., 2008, “Obesity status and sick leave: a systematic review” in Obes Rev. 2009 Jan;10(1):17-27. NOO, 2010, The Economic Burden of Obesity. National Obesity Observatory, October 2010. OECD, 2010, Obesity and the Economics of Prevention: Fit Not Fat. Rubino, Francesco; Kaplan, Lee M.; Schauer, Philip R.; Cummings, David E., 2010, “The Diabetes Surgery Summit Consensus Conference: Recommendations for the Evaluation and Use of Gastrointestinal Surgery to Treat Type 2 Diabetes Mellitus” in Annals of Surgery, March 2010 (251): 3, pp. 399-405. Francesco Rubino, David M. Nathan, Robert H. Eckel, Philip R. Schauer, K. George M.M. Alberti, Paul Z. Zimmet, Stefano Del Prato, Linong Ji, Shaukat M. Sadikot, William H. Herman, Stephanie A. Amiel, Lee M. Kaplan, Gaspar Taroncher-Oldenburg and David E. Cummings, 2016, “Metabolic Surgery in the Treatment Algorithm for Type 2 Diabetes: A Joint Statement by International Diabetes Organizations” in Diabetes Care 2016 (39), pp. 861–877. Sassi, Franco, Marion Devaux, Michele Cecchini, Elena Rusticelli, 2009, The Obesity Epidemic: Analysis of Past and Projected Future Trends in Selected OECD Countries. OECD Health Working Papers 45. Trasande L. and Elbel B., 2012, “The economic burden placed on healthcare systems by childhood obesity” in Expert Rev Pharmacoecon Outcomes Res. 2012 Feb:12(1), pp. 39-45. Tyrrell, Jessica, Richmond, Rebecca and Palmer, Tom, 2016, “Genetic Evidence for Causal Relationships Between Maternal Obesity-Related Traits and Birth Weight” in JAMA. 2016:315 (11), pp. 1129-1140.
WHO, 2016, Global Report on Diabetes. World Health Organisation.